So you're ready to make a purchase from ParisPass, just click a ParisPass coupon codes provided here, and copy it. After that, just paste the code into the coupon box during checkout, your discount should appear automatically. With GetDiscountCoupon.com, you'll find only the latest parispass.com discount coupons. Visit Arc De Triomphe for Free - Save over 9 Euros! Save at Chateau de Vincennes with a Paris Pass. Save 29 Euros on Hop-On-Hop-Off Paris Bus Tour. Free entry to Grevin Wax Museum - Saving 23.50 Euros! Full benefits you get with the Paris Pass. Discover more and spend less with The Paris Sightseeing Pass. Save on sightseeing in Paris with The Paris Pass - The Complete Sightseeing Package. Save at Villa Savoye with a Paris Pass. Free Entry to La Conciergerie with The Paris Pass. Free cellphone and sim rental at Cellhire. Free Gift at the Fragonard Parfume Museum. Visit Centre Pompidou for free - Save 13 Euros! Save Time and Money when sightseeing in Paris with The Paris Pass. Never miss coupons from ParisPass! Enter your email below and we will send you the latest and greatest ParisPass deals. The Paris Pass is the ultimate sightseeing package which provides access into over 60 world famous museums, art galleries and monuments in Paris. Made up of the Paris Museum Pass, Paris Attraction Pass and Paris Visite Pass, you can buy it for 2, 4 or 6 fixed day durations. Discover and explore Paris the easy way with The Paris Pass. After activation your Paris Pass remains valid for the duration that you have purchased. It is valid on consecutive days and at the end of the validity period, will no longer entitle you to free entry at attractions or transport. If for example, you used a four day pass for the first time on Monday, your pass will cease working at the end of Thursday, regardless of how often you have used it in between. Paris Museum Pass - free entrance to over 60 of Paris' world famous museums and monuments. Paris Attractions Pass - free entry to popular attractions including a Seine River Cruise, Musee Grevin, Tour Montparnasse and even a Wine Tasting experience! Paris Bus Tour - free Hop-on-hop-off bus tour of Paris with Les Cars Rouge, show your Paris Attractions Pass to pick up a 1 day unlimited use ticket. Fast Track Entry - skip the lines at a selection of the busiest museums and attractions in Paris. 120+ page Guidebook - a detailed guide to all of the sights and landmarks in Paris including a map and directions as well as loads of helpful tips and hints. Special Offers - exclusive offers at shops and restaurants in central Paris. Once you have find the available Parispass.com promo code, choose the best Parispass.com code according to your needs because you can have multiple promo codes for Parispass.com. 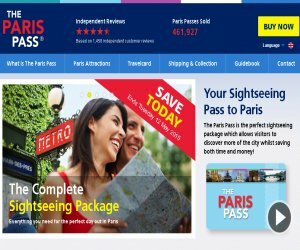 You should check any restrictions and policies before applying coupon, such as expiration date, because some coupons are valid for very short period, So if you need a Latest Parispass.com Promo Coupon / promotion code please BOOKMARK US (Ctrl + D) and check this site frequently. And one important thing some coupon codes are case-sensitive.